When number of options is huge, it is important to have some tools that will help you with your decision. More often than not prospective students learn about their options through MBA rankings, but that’s only one of the steps, after taking a look at the rankings students need to research each of the schools separately, employment reports, regional placements, curriculum, quality of student body, flexibility, potential impact on you as a person and a professional etc. So it only follows, that after students look at the rankings and chose 5-7 schools close to each other (a few stretches, reaches and safe schools), they should not be surprised by differences when they look into employment reports and other detailed data. And that’s one of the reasons US News and World Report ranking is the most popular ranking tool – there are not a lot of fluctuations and similar schools are grouped together (when I just started looking at MBA programs I didn’t know about how strong Kellogg is because I used FT rankings, which have very little to do with reality, so if not for further research I wouldn’t have known that Kellogg is a top 5 school). But this year it might be different, at least in top-20. A few upsets made me question this ranking and reassess its value. 18% of students looking for jobs accepted offers in the 3 months after graduation. In case of weaker schools I would have suspected that these students just had to look for jobs after graduation, because they couldn’t secure an offer earlier, but in case of elite schools, that reasoning is most likely not correct. This anomaly, I suspect is explained by PE/VC/HF and start up recruitment, they are the last to hire and require some additional time commitments from students, and if that guess is correct, than it tells us that Stanford students are not afraid of taking risks, which speaks volumes about their confidence on employment opportunities. Unfortunately that is not measured by US News report, making it a bit less trustworthy. I know for a fact that Booth career office encourages students to not accept offers they don’t like, as they are confident they can get their MBA’s better ones. It follows that not accepting an offer doesn’t necessarily mean a bad thing. 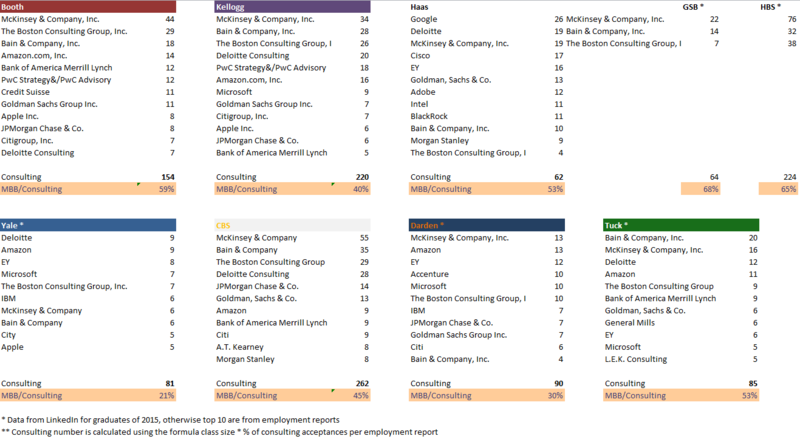 As homage to Big Mac Index, I used MBB/Consulting index to put employment reports in perspective. I didn’t do the same for IB due to decline in placement; I think in 2016 Consulting rules the MBA employment. And this small and a bit flawed report (can’t fully trust Linkedin, hence the lack of Wharton) shows the difference in QUALITY against quantity, something that MBA rankings don’t take into account, but they should. Yale is a great program, but it is not better than CBS, it should not be tied with Tuck and it is not that far ahead of Darden (if at all) this year. Probably, by 2020 Yale will be among top-8 schools due to merit, not flaws in rankings. Especially considering that rankings are self-fulfilling prophecies, if before Yale admits often were choosing between M7 and Top-15 school, now they will be choosing M7 vs Top-8, and while in first case it was a difficult choice to make, now it seems much easier and add to that Yale’s name, a name that is much better known than other M7 schools, with the exception of Harvard, Stanford and MIT. New York schools drop in rankings, CBS #10 (-2) and Stern #20 (-9). Though both schools are placed lower than they should be in my opinion, the reasons are quite different, CBS was poorly performing in this ranking for quite some time now, so they just continued drifting lower, though their employment reports are quite clearly top-8. As of NYU Stern, their dean wrote this article: http://www.stern.nyu.edu/experience-stern/news-events/us-news-2017-rankings and it kinda raises certain questions about US News ranking, is it really right to knowingly release wrong data? What if HBS or Stanford were in that situation? Are there other data points that were filled in using flawed ‘estimation’ process? This situation with Stern is a good example of why people shouldn’t take rankings at face value, even they are prepared by US News and World Report, and considering that Bloomberg BW guys are not afraid of adapting and fixing flaws, I think they can take the place of most prestigious rankings for MBA’s if this year they will avoid mistakes similar to those listed. Great LinkedIn analysis! Very interesting to see the comparison but curious as to how you went about it. Did you have to find each 2015 graduate individually to tally? Can you comment on why you didn’t look into Wharton on LinkedIn / why it wouldn’t be reliable? Hi Tristan! Thanks for kind words, Linkedin provides capability to filter by school, grad year and employer, so it wasn’t very difficult (my network is quite wide, so I didn’t encounter any ‘hidden’ profiles). As of Wharton, the problem lies within variety of programs, linkedin doesn’t allow for program filters, so it groups MBA, EMBA, PTMBA and some schools, including Wharton, have also undegrad programs, so data mining has to be manual, it is doable, but it takes time.